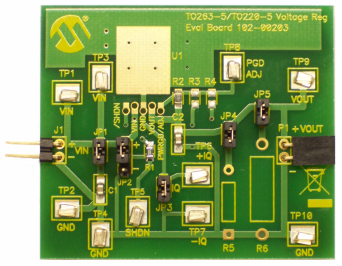 The board features two voltage options (1.8V and 3.3V) and two package options (5-Lead SOT-23 and 1x1 UQFN). Test points are provided for input and output, allowing the board to be connected directly to a system. The two LDO’s can be powered and used independently. 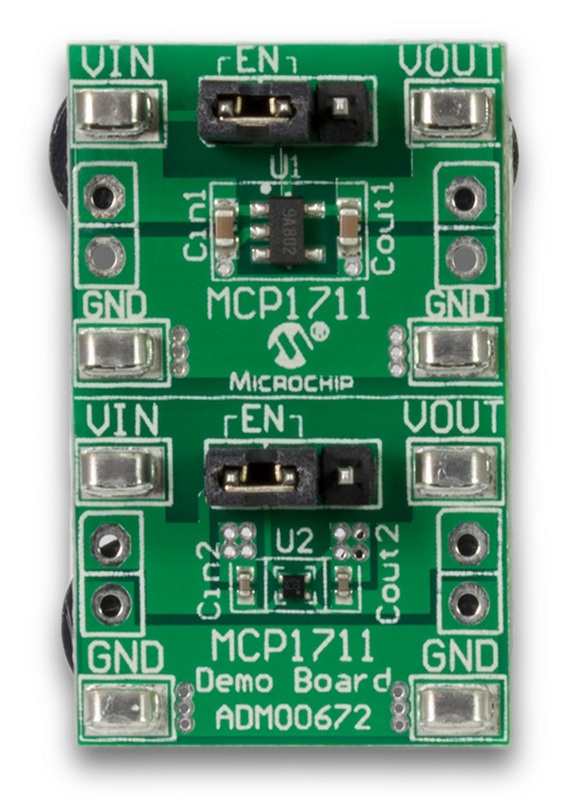 Header pins are used in order to enable and disable the MCP1711 with either a jumper or an external voltage source. 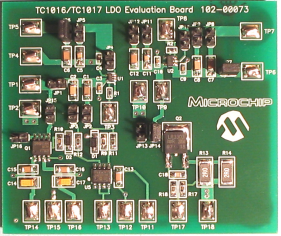 This evaluation board is used to demonstrate the MIC5166. The MIC5166 is a ±3A, high-speed, linear, low input voltage, Double Data Rate (DDR) or Quad Data Rate (QDR), memory terminator power supply. The MIC5166 has two internal N-channel power MOSFETs, forming a linear regulator that can both sink and source current. This regulator design is used for DDR or QDR termination. 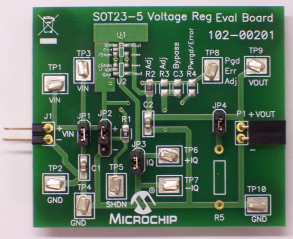 This evaluation board is used to demonstrate the MIC5234. The MIC5234 is a low-quiescent current, μCap low-dropout regulator. A maximum operating input voltage of 30V and quiescent current of 20μA make it ideal for supplying keep-alive power in systems with high-voltage batteries. The demonstration board can be used to evaluate both the MIC5301 and MIC5318 low dropout linear regulators. 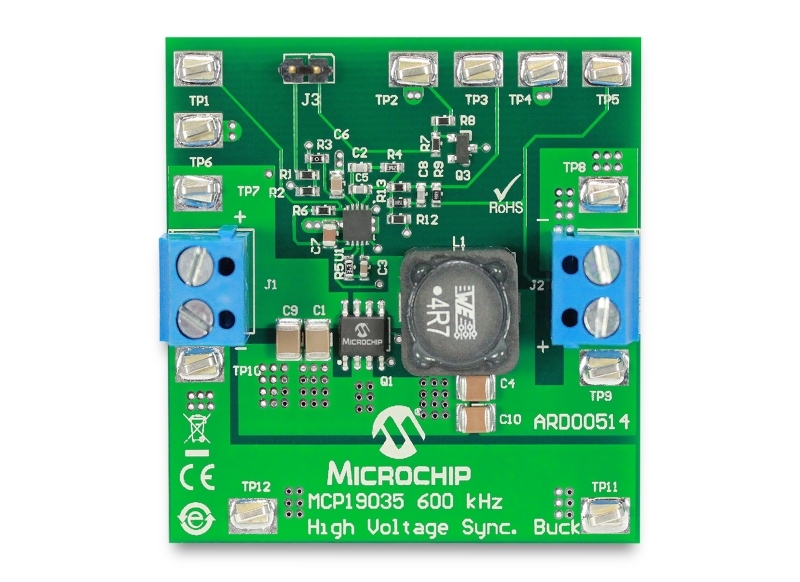 The MIC5301 and MIC5318 are offered in fixed and adjustable outputs. Fixed output versions add bypass pin functionality, allowing reduced output noise. The adjustable version allows for the use of a resistor divider network to adjust for the desired output voltage. The evaluation board accommodates the fixed version. The MIC5380/1 is an advanced dual LDO ideal for powering general purpose portable devices. When the MIC5381 is disabled an internal resistive load is automatically applied to the output to discharge the output capacitor. The MIC5387 is an advanced, general purpose tripleoutput, linear regulator offering high power supply rejection (PSRR). 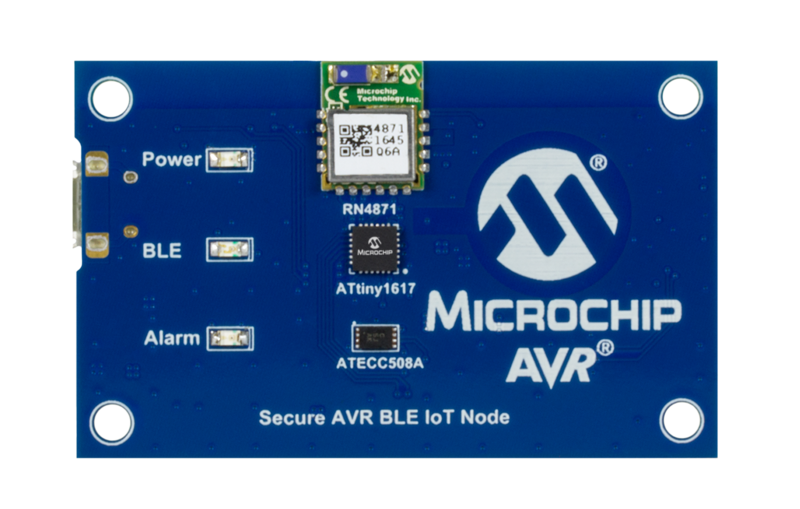 The MIC5387 is capable of 150mA from each output and offers high PSRR, making it an ideal solution for any portable electronic application. 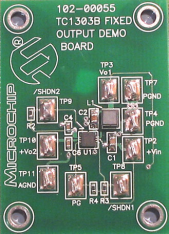 The demonstration board can be used to evaluate the MIC59300. The MIC59300, a 3.0A, ultra-high speed, low dropout linear regulator, utilizes a split supply input to regulate low output voltages. It is offered in fixed and adjustable outputs. The adjustable version allows the use of a resistor divider network to adjust the output voltage. An enable pin allows it to be placed in a zero-current off mode state. The evaluation board accommodates the adjustable version. The MIC68220 Evaluation Board contains a MIC68220 chip with built-in resistor dividers, delay and ramp capacitors, and programmable jumpers to allow a variety of Master/Slave configurations including sequencing, tracking, and ratiometric tracking. 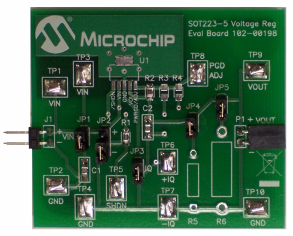 This eval board is used to demonstrate the MIC68400. The MIC68400 is a high peak current LDO regulator designed specifically for powering applications such as FPGA core voltages that require high start up current with lower nominal operating current. 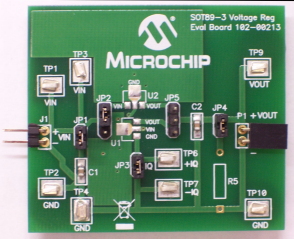 This evaluation board can be used to evaluate The MIC69101YML, a 1A LDO with a fixed output voltage that offers the added functionality of an enable pin and an error flag output. 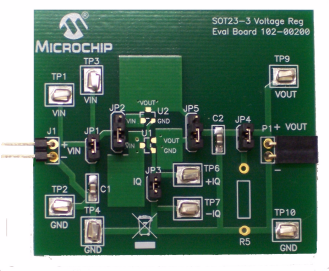 This evaluation board can be used to evaluate The MIC69101YML, a 1A LDO with a fixed output voltage that offers the added functionality of an enable pin and an error flag output. The MIC69103YML is an adjustable version and it also has the added functionality of an enable pin, allowing the user to disable the device and put it into a zero-current off mode state.